David Brown holds an American flag aloft as he and his sighted guide, Jerome Avery, celebrate Brown’s Paralymic record time of 10.99 seconds in the 100 meter dash at the 2016 Paralympic Games at Olympic Stadium in Rio de Janeiro, on Sunday, Sept. 11, 2016. Francine Brown, the mother of Paralympic sprinter David Brown, bursts into tears of joy after her son ran a Paralymic record time of 10.99 seconds to win gold in the 100 meter dash at the 2016 Paralympic Games at Olympic Stadium in Rio de Janeiro, on Sunday, Sept. 11, 2016. Majid Farzim, of Iran, celebrates after breaking the Paralympic and world records in the 80 kg class at the 2016 Paralympic Games in Rio de Janeiro on Monday, Sept. 12, 2016. 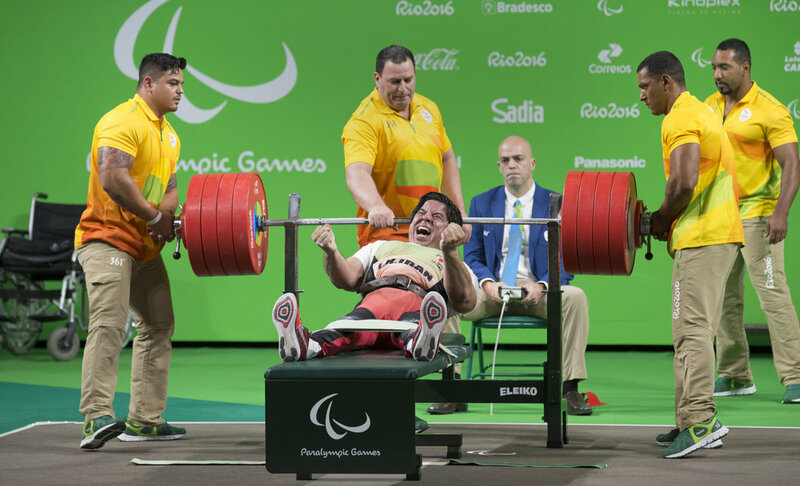 The 2012 Paralympic gold medalist lifted 240 kgs to beat the existing record and win gold again. 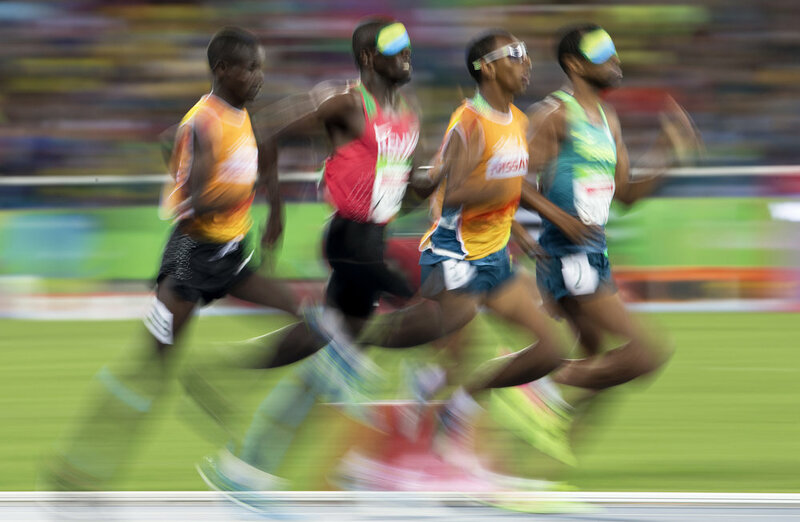 Odair Santos, far right, and Samwel Mushai Kimani, second left, battle it out for gold during the men’s 1500m final at the 2016 Paralympic Games in Rio de Janeiro, Brazil, on Tuesday, Sept. 13, 2016. Samwel Mushai Kimani and his guide James Boit won the race. Mexican forward Jorge Lanzagorta gets flattened by Moroccan defender Imad Berka after the two collided while fighting for control of the ball in football five-a-side Thursday, Sept. 15, 2016, at the 2016 Paralympic Games. Mexico scored twice in the second half to win the game, 2-0. Gail Gaeng reacts after the U.S. team defeated Germany and won gold during the wheelchair basketball game at the 2016 Paralympic Games in Rio de Janeiro, Brazil, on Friday, Sept. 16, 2016. Brazil's Lia Martins takes a selfie with fans after Brazil's game against the U.S. in the women's wheelchair basketball quarter finals at the 2016 Paralympic Games in Rio de Janeiro, Brazil, on Tuesday, Sept. 13, 2016. The U.S. defeated Brazil 66-35. 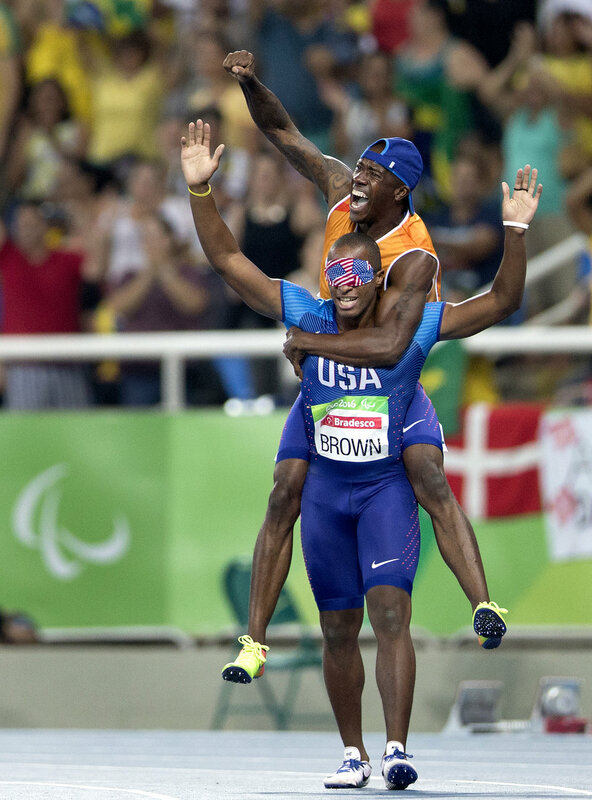 Jerome Avery, David Brown’s guide, jumps ontop of Brown’s back and celebrate Brown’s Paralymic record time of 10.99 seconds in the 100 meter dash at the 2016 Paralympic Games at Olympic Stadium in Rio de Janeiro, on Sunday, Sept. 11, 2016.